Kids Create: Cork Reindeer Ornament – …. 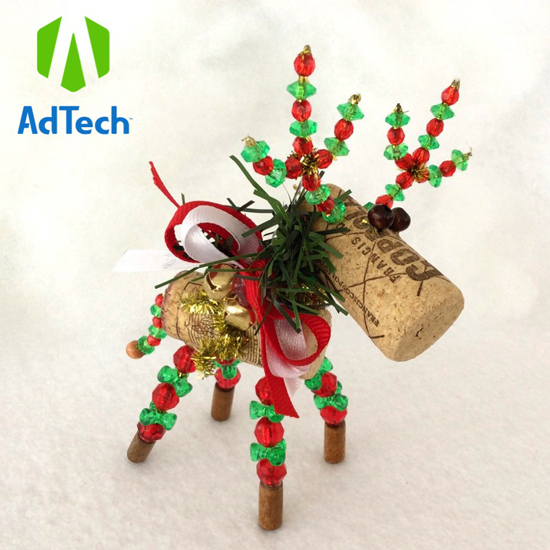 Get ready to deck the halls with AdTech’s NEW collection of SCENTED hot glue! Throughout the Thanksgiving season festivities leading up to Christmas, the wine corks seem to really pile up! This fun and easy scented reindeer ornament project makes clever use of those corks, by transforming them into customized décor for your Christmas tree! Makes the perfect last minute hostess gift or add on to a wrapped present! Step 1. With the wire cutters, cut four 2” pieces of pipe cleaner for the reindeer’s antlers. Gather the small beads for the antlers as shown. Step 2. Twist the pieces together as shown to form two cross-shaped pieces for the antlers. Step 3. Run the small beads onto the antlers. Then trim the excess pipe cleaner on the antler ends to approximately 1/8th of an inch. Then secure the beads on the ends of the antlers with a small bead of the scented hot glue. Step 4. Now you are ready to begin work on the legs. Cut four 2” pieces of pipe cleaner. Lay out the coordinating beads for the legs. For this reindeer we used wooden bead for the feet and plastic beads for the legs. Feel free to make it your own by choosing beads that go with your holiday décor theme! Step 5. Assemble the legs by running the beds onto the pipe cleaners and securing the ends with more scented hot glue. Step 6. To create the reindeer’s neck, cut a 1” piece of pipe cleaner. Step 7. Run three beads onto the pipe cleaner for the neck. Step 8. To assemble the head and body, make holes for each end of the neck, using an awl to pierce the corks. Step 9. Connect the head to the body by inserting the pipe cleaner into the holes and secure each end with a touch of the scented hot glue. Step 10. Cut a 1.5” piece of pipe cleaner for the tail. Step 11. Run small beads along the length of the tail and secure with a drop of scented hot glue on the end. To add interest, we accented the end of the tail with a wooden bead. Step 12. Now you are ready to continue assembling the rest of the reindeer parts. With the awl, poke more holes for the legs, antlers and tail. For ease of assembly, trim away any excess length from the ends of the pipe cleaner. You only need the pipe cleaner to go about ¼” deep into the corks. Step 13. Secure all the parts to the body with small drops of glue. The AdTech Precision PRO glue gun features a fine detail nozzle and a precision control trigger, which it makes it perfect for getting into all the tight and tricky spots. Step 14. Create eyes for the reindeer n the same manner, using small beads and a very short piece of pipe cleaner. Step 15. Attach the eyes in the same manner as you did the rest of the body parts. Feel free to mix it us and use googly eyes or little pompoms for this step! Step 16. With the jewelry wire and pliers, create a little loop for hanging the ornament. Step 17. Poke another small hole in the back of the reindeer’s head. Secure the loop in the hole with more of the scented hot glue. By now your craft room will be bursting with the nostalgic holiday scent! Step 18. Gather up your supplies for the reindeer’s collar embellishment. For this design we used ribbon, jingle bells and a sprig of artificial pine. Other options for this part could include: buttons, real pine, yarn, holly leaves, charms, dangly beads or even a miniature knitted scarf! Step 19. Assemble the bow for the neck onto a piece of pipe cleaner, securing all of the elements with the scented hot glue. Step 20. Twist the pipe cleaner around the reindeer’s neck and bend the excess length into a wavy line so it looks as though it’s blowing in the wind.